The TC400-EX-TDM from Dolgin Engineering features integrated battery plates that support Sony and third-party BP-U30, BP-U60, and BP-U90 batteries. These batteries are used with Sony's PXW-FS7, PMW-EX1, PMW-EX3, PMW-100, PMW-200, and PMW-300 cameras. 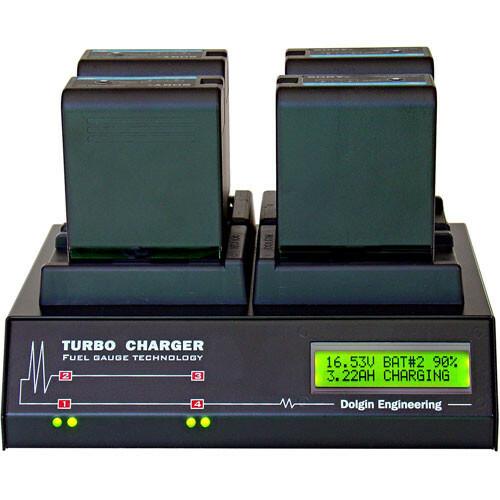 The TC400-TDM has fully independent channels and provides simultaneous charging to all four batteries. This particular model will charge a single or up to four BP-U60 batteries in approximately 4 hours. Box Dimensions (LxWxH) 11.8 x 9.5 x 4.2"